This time of year, I receive many complaints of pumpkin plants with yellow leaves. 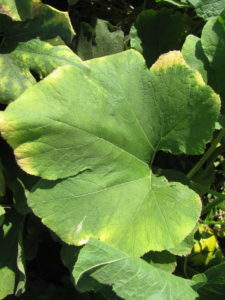 There can be many reasons why pumpkin plants have yellow leaves. The most common reason for yellow pumpkin leaves doesn’t have anything to do with a disease that can spread from plant to plant. Usually, the reason for the yellow pumpkin leaves has to do with lack of water, weather that has been too hot, nutrient deficiency or other stresses. The photos and discussion below will, I hope, illustrate my point. Let’s say you have a pumpkin field where you have pumpkin leaves that are yellow and you are wondering about the cause. You may want to ask yourself, which leaves are yellow and where are they yellow. In Figure 1, yellow pumpkin leaves may be observed. When one looks a bit closer to find out where the yellow leaves are, one can see that the yellowing runs down the row. In fact, it is the older leaves that are yellow (Among plant biologists, we prefer the term chlorosis to yellow. But I will continue to use the word yellow here.) When older leaves are yellow and the younger leaves appear green and healthy, the reason for the yellowing is usually stress related-as indicated above. I am not too worried about this type of yellowed pumpkin leaves. Figure 1. 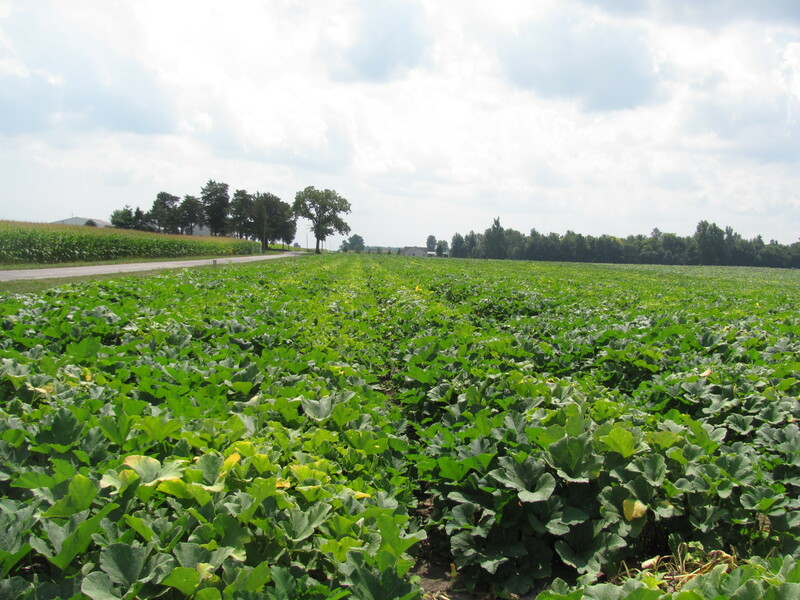 The yellowing of these pumpkin leaves seems to run down the row. Look again at figure 1 to try out which part of the leaves are yellow. For the most part, the portion of the leaves that are yellow are the edges (or margins) of the leaves (Figure 2). One doesn’t see entire leaves that are yellow. The yellowing doesn’t appear in the interior of the leaves. Yellowing on the outside of the leaf normally means that the reason is stress related as discussed above. Older leaves tend to become yellow with time because nutrients like nitrogen are mobile in the plant and will move to the younger leaves where they are needed. In addition, the edges of leaves may become yellow because the edges of leaves have pores where sap (known as the water of guttation by botanists) is secreted at night. This sap may have a mildly toxic effect on the leaves over time—this is the reason that the edge of older leaves may become yellow. Figure 2. The edges of this pumpkin leaf are yellow, most likely due to environmental stress. 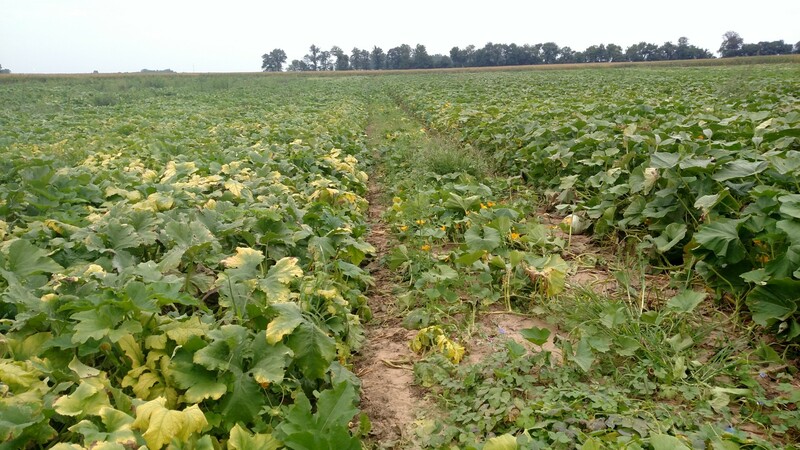 In figure 3, the yellowing of the pumpkin leaves is more generally over a larger area in contrast to figure 1 where the yellowing could be seen to run down a row. Most of the yellowing appears in the foreground of the photo in figure 3. If one looks down the hill, the leaves appear green and healthy. Now, let’s look at the soil next to the symptomatic pumpkin leaves. The soil appears sandy. Figure 3. This view is from the top of the hill looking down. The pumpkin plants in the foreground of this photos have yellow leaves. The soil is sandy at the top of the hill. 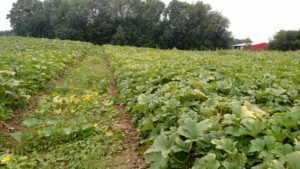 Next, we will walk down the hill where the pumpkin leaves are green and look back up toward the yellowed pumpkin leaves (Figure 4). Again, we notice that the area on top of the hill are in a general area—they don’t seem to run down a row. That is, it isn’t just the older leaves that are yellow. Now, take a look at the soil next to the green pumpkin leaves at the bottom of the hill. The soil is much heavier with more of a clay content than the soil at the top of the hill. Figure 4. This view is from the bottom of the hill looking up. The pumpkin leaves at the bottom of the hill are generally green and healthy. The soil at the bottom of the hill is relatively heavy. The lesson here is that the pumpkins at the top of the hill had much less access to water than the bottom of the hill. This is true both because hills tend to be better drained and because sandier soils hold less water. The grower had drip irrigation in place, but was not able to pump much water due to lack of water in a surface pond. Therefore, the yellowing leaves at the top of the hill is due to drought stress. Both of the fields of pumpkins pictured here produced good crops. The yellow on the pumpkin leaves does not necessarily indicate a disaster or a disease is in the future. I hope the photos and discussion presented here will help one to figure out what is wrong in one’s pumpkin patch. However, if one still has questions about symptoms, it is best to send off a sample to a diagnostic laboratory. 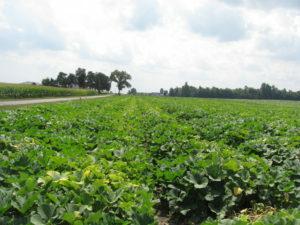 Purdue University’s Plant and Pest Diagnostic Laboratory is an excellent resource https://ag.purdue.edu/btny/ppdl/Pages/default.aspx.